The 2018 Harley Davidson Fat Bob – Who Says You Can't Reinvent The Wheel? The launch of the new H-D Softail range has certainly caused a splash in the cruiser world, especially when it comes to the 2018 Harley Davidson Fat Bob. Not content with a total re-design for the Softails, Harley used the launch to break the news of no more Dyna's. 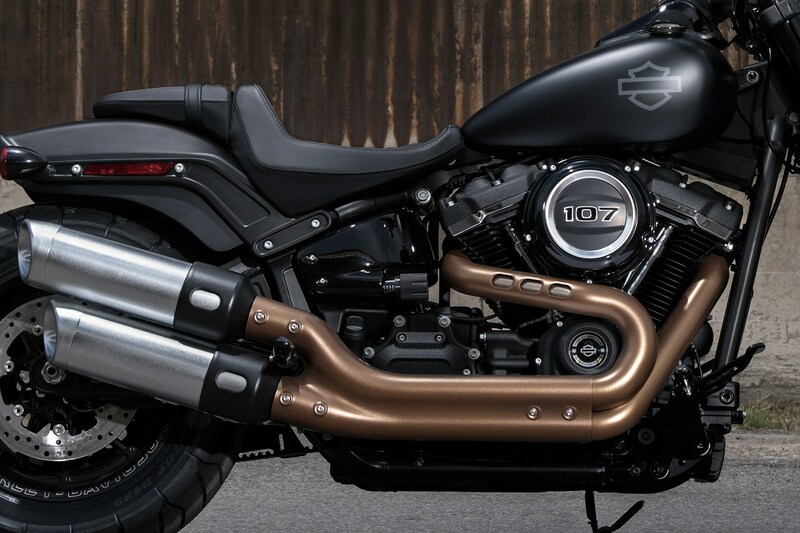 So first, let's take a close look at the bike that the factory say will change the way we look at Harleys; the Softail Fat Bob. It’s never good when motorcycle manufacturers have to redesign their range to comply with strict emission laws. Invariably, catalytic converters get bigger, engines get quieter, and bikes end up looking worse and weighing more. 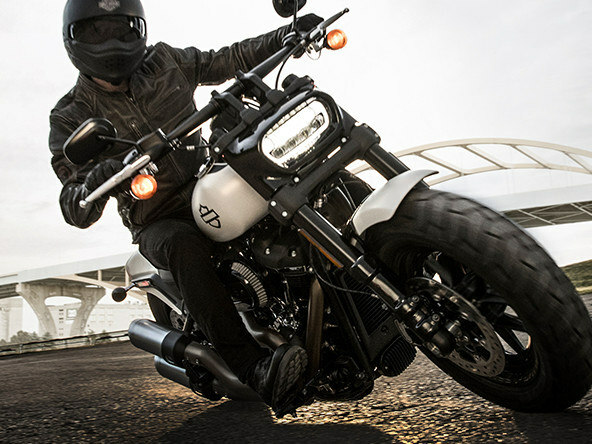 Worse still is when a serious rethink of the brand is brought on due to slowing sales, this is the double whammy that faced H-D.
Harley’s response was not the usual engine tweak and new paint, in fact, it's safe to say that the 2018 range of Softails are completely new bikes. The Fat Bob, in particular, is the standout bike from the launch. 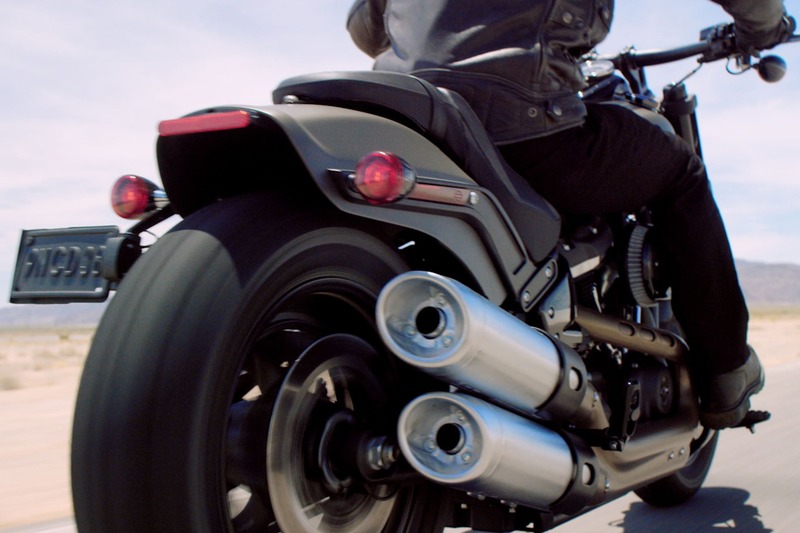 Despite Harley saying they’ve kept the spirit of the old Dyna models alive, hence the name Softail Fat Bob. The alternative wasn't a realistic option; the SoftBob! If you’re going to dump one of the best-loved range of models from your lineup, then let them go. This recycling of the name is just rubbing salt in the wounds of die-hard Dyna fans. Anyway, let's talk engines. The Fat Bob’s engine is Harley's latest Milwaukee 8, so called because of its eight-valve cylinder heads. This engine is only the third all new power plant to leave the factory in 80 years, so you can see why they're making a song and dance about it. 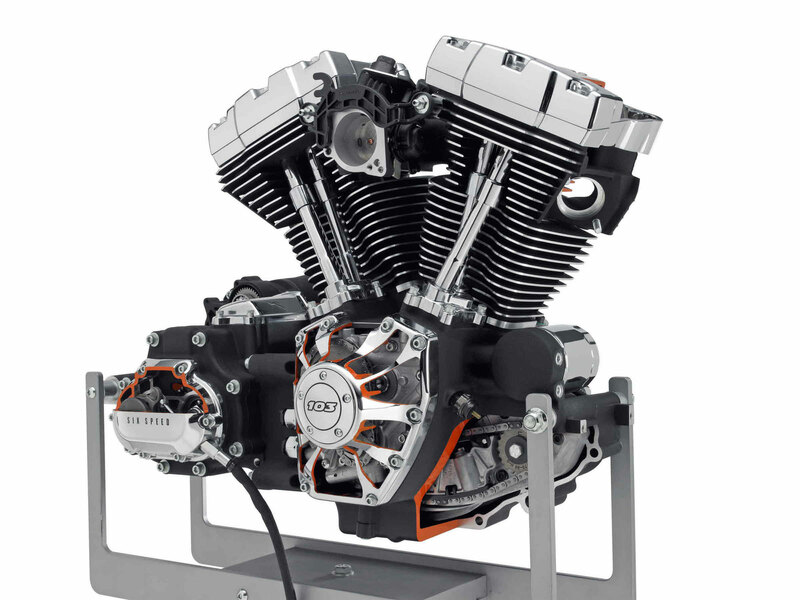 Released last year to fire up the new baggers in the lineup, the base engine features a 107ci (1750cc) capacity while the more cooking version is the 114ci (1970cc) the Bob gets the option of both. In the base model, cooling comes in the shape of a two-tier system of air and oil. The new heads get 50% more air-flow, the addition obviously being the new oil cooling system. The system features oil channels that run between the exhaust bridge of the valve seats. The oil from which runs through an oil cooler mounted between the frame tubes at crankcase level. 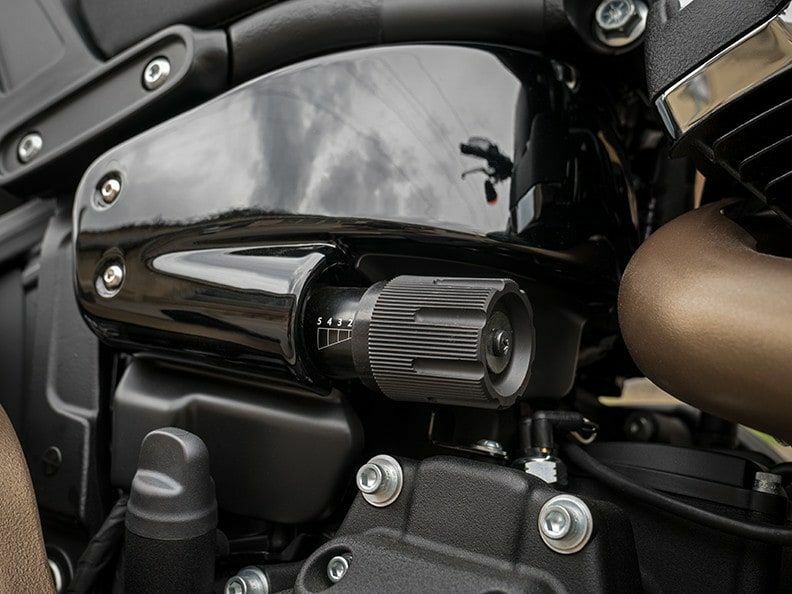 Softail fans may have a moan at the addition of the ungainly cooler, but you have to pay for higher compression levels and more power somewhere down the line. 2018 Harley Davidson Fat Bob Has More Power! More power there certainly is, Harley claim rather poetically, 107ftlbs of torque from the 107ci engine at a mere 3,500rpm. With the extra cooling in the heads, the compression ratio can go as high as 10.5:1, which is a pretty good jump considering the Evo ran 8.5 and the Twin Cam, 9.0:1. The cylinder head covers also go back to the future by featuring real lumps! Apparently, lumpy covers haven't been a feature since the last knucklehead left the factory. As for the bottom end, a single four lobe cam now operates the push rods, which, says the factory, is to give the bottom of the engine a more defined V look. Power output for the 107 engine is now a healthy 92hp. Add the extra torque, and there's a significant difference in 0-60 times and the all-important 60-80 overtaking range when compared to the 103B Twin Cam. Incidentally, the M-8 engine is now also wet sump, so the demise of that beloved horseshoe oil bag will also get the traditionalists crying into their Daytona Bike Week bandanas. There’s even 50% more output from the alternator, but this is apparently aimed more for the baggers. All that and increased fuel economy, thanks to new mapping and cooler running heads and it looks like H-D have done their homework. Any company wanting to remain in business has to react to adverse market conditions and try to attract a whole new demographic of rider. Interestingly, Harley also cites the results of intensive surveying of customers as one of the prime reasons for the major remodel. Reaching out to over a thousand customers via dealers across the world, H-D marketing gurus condensed the bottom line to a few basic ‘wants.' These consisted of more power for two up duty and increased chassis agility in the bends. Customers also wanted the bikes to be more user-friendly as far as size goes and a cooler running engine. In other words, Harley riders wanted more power with less heat and lower seat heights but better ground clearance. Four basic principles, which are totally at odds with each other. Surprisingly H-D didn't call it a day and get back into the bowling business (Any AMF fans out there?). However, they didn't what they've done is reinvent the Harley wheel. And as distinctive as the new M-8 engine is, it's the all-new chassis that tells the story. Gone are the Softails trademark twin under-slung shocks, replaced with a single rear shock that runs inline with the top tube. This repositioning of the suspension allows for an absolutely straight line from the rear wheel spindle to the steering head. Not a brand new idea by any stretch of the imagination but a brave one for H-D to take nevertheless. A hand adjustable linear damped Showa unit on the back now handles suspension adjustment. 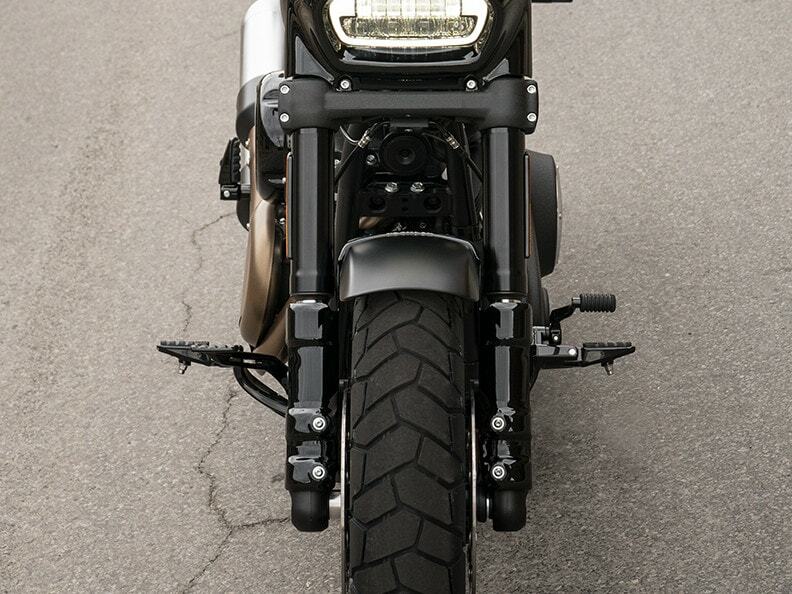 Together with a 43mm cartridge-type inverted Showa fork on the front, the Fat Bob takes on a real streetfighter look. The wheelbase is less than an inch shorter, but due to those chunky 16'' rubber boots, 28-degree rake and sawn-off fenders, the bike looks positively squat. When seeing the first riding pics of the Fat Bob I thought they were spy shots, and that exhaust had been rigged up to hide the real one. But this is what happens when you make such radical changes to your lineup. The 2-2 exhaust almost has a hint of Ducati Diavel about it, so perhaps Harley is setting their sights on the burgeoning power cruiser market to attract new fans. 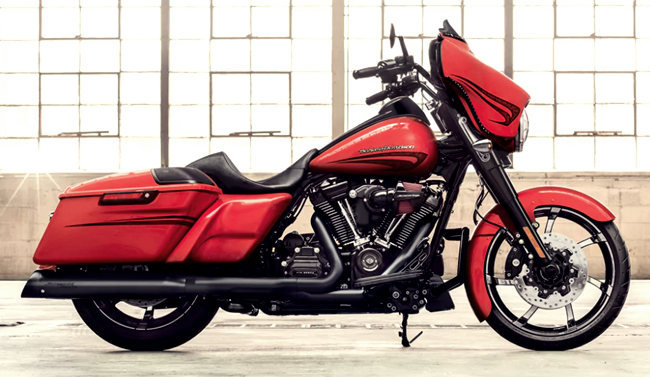 No question, it's an interesting looking bike and the most radical and controversial Harley since the V Rod. It’s applaudable that there’s now a Harley that handles, goes and stops right out of the crate and in that respect H-D have knocked it out of the park. It’s a sad indication though of corporate life that such radical changes and the demise of an entire range are due as much to shareholder dividends as it is to natural evolution. Perhaps that’s a bit cynical, but whatever the reason for the 2018 Harley Davidson Fat Bob's creation, it's one hell of a bike.